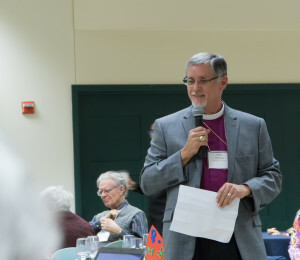 The theme of the 2016 Diocesan Convention — On fire with the Spirit – offered a teachable moment at the Friday night dinner as well as an opportunity for a bit of fiery foolishness that included some roasting of Bishop Scott Mayer. 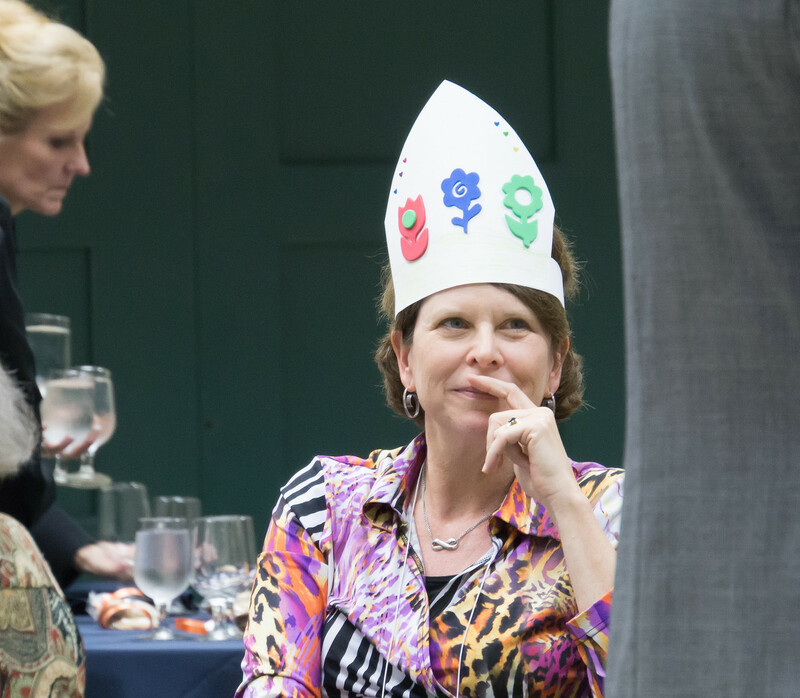 Because he returned from his sabbatical all fired up, he was presented with a “fiery mitre” constructed by Administrative Assistant Michele King. It was inspired by a headdress worn by actress Sarah Jessica Parker at the 2015 Metropolitan Museum of Art Costume Institute Gala. 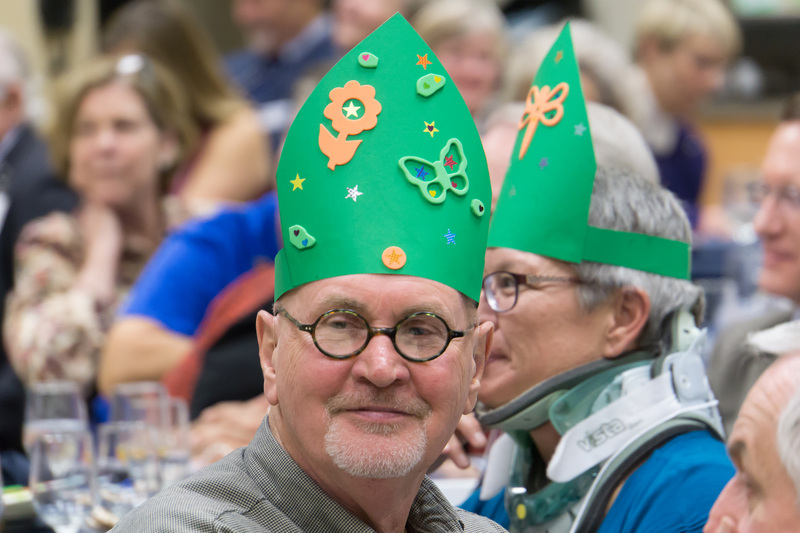 Not only that, everyone at the dinner was given a mitre to decorate and take home. Workshop presenter Catherine Lillibridge was accompanied by her husband, Bishop Gary Lillibridge of West Texas. Since they are good friends of Scott and Kathy Mayer, Bishop Lillibridge seemed the perfect “roaster.” He gave a short discourse on the bishop’s mitre, and why it is flame-shaped. 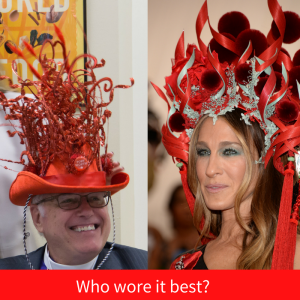 This was more than a bit ironic, because the bishops of West Texas do not wear mitres. He explained that mitres “might well be called ‘Pentecost hats,” and told the story on Pentecost, when the Holy Spirit descended upon the apostles. In art works, the flames of fire above the apostles’ heads became iconic. These flames resting on the heads of the earliest leaders of the church are represented by the mitre, the flame-shaped hat that bishops wear. It reminds us that bishops are seen as chosen by God to continue the work of the earliest disciples in leading the Church. The mitre is a visual reminder of the meaning of the office of bishop. He said, “Given that your bishop has returned all fired up from his sabbatical, we wanted some fiery way to welcome him back. The staff and I discussed many possibilities. In fact it ignited quite a debate. Sparks flew. “He’s a very truthful man, so pants of fire didn’t seem appropriate. And it didn’t seem worth our time to set his hair on fire. Just sayin’ there’s not much fuel up there. But don’t get hot under the collar. OK? “Oh, and Scott, we are talking about fire. That’s F-I-R-E. That’s pronounced Fi-er. Not ‘far’. Yes, the puns were awful. Then, because the Holy Spirit is God in and among us, the intimate and indwelling God who in our baptisms is given to be with us, it seemed appropriate that everyone get a mitre to decorate and take home. Convention address: "On fire with the Spirit"